I was super duper blessed to be commissioned to create the artwork for this poster for this years Akonadi “Racial Justice” poster by the Akonadi foundation. The foundation does some important and vital work to push racial justice to the forefront of organizing and activist discussions here in the Bay Area and nationally. Without folks like them, we would not be forced to ask hard questions until another tragic event happens or another Ethnic Studies program is banned. I first applied to compete among some great artists in this competition back in 2010 I think. I did not win, but i think showing up and fighting means something because they commissioned me to create this years poster which will be seen by many I hope. More importantly though, I hope people will think about the fight going on to maintain, introduce, and expand ethnic studies programs here in the US, in so called progressive cities, and all across the US. Not just in universities, but in public schools because that is where it is needed the most. One of the biggest ways you can bring a people down, ignore them, render them invisible, and oppress them is by convincing them that they have no history (that they don’t exist). And with people of color here in the US that is especially important because our ancestors built this country with their blood and their backs. I get so frustrated when people try to squash race or pretend that its not an issue when you look at who’s story is being told in depth, with honesty, humility, intelligence, love, and passion it is not always ours. 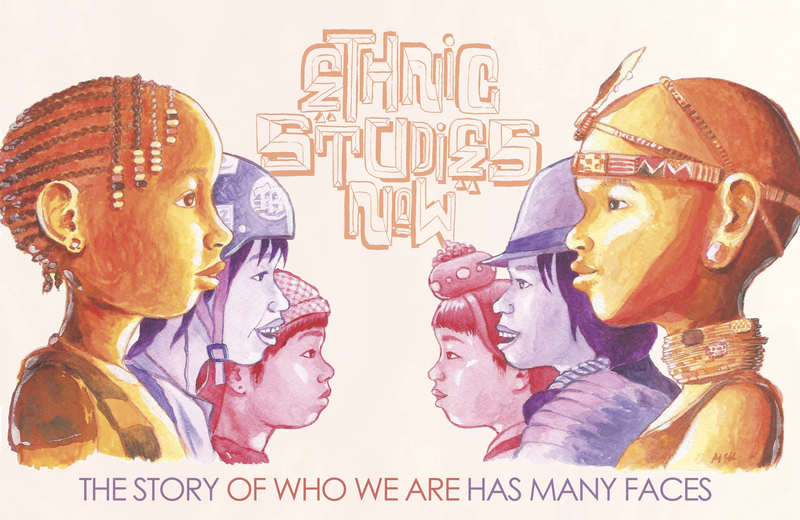 The issue of ethnic studies is very personal to me because I come from a family of many diverse backgrounds. Asian, African, Latino, Indigenous, and I’m sure European somewhere in there too. My son comes from even more! My grandparents combined spoke 4 languages. Growing up I overstood the differences and similarities between my cultures and my families, but there were also times when I didn’t know who I was. And when I saw some people suffer or some people treated unjustly, I wondered what I could do. Fast forward, I’m doing something. Not just highlighting the negative but giving a voice to my story, one which I hope more children and adults like me can relate to.